This article discusses some aspects of the swimming technique in backstroke, and more specifically body position, body roll, and head position. A good position of the body is essential to swim backstroke. In backstroke, you float on your back in the water. Your body is almost horizontal, with a slight tilt toward the feet. This slight tilt allows you to flutter kick without your legs breaking the water surface. Beginners often have trouble getting into or maintaining this horizontal position. Their hips and legs sink, and the whole body gets dragged down. The face drops below the water surface, and breathing is disrupted. 1) You don’t lean back enough in the water. Leaning back presses your lungs down in the water. As your lungs are the most buoyant part of the body, pressing them down causes your hips and legs to rise because your body acts like a seesaw as long as it is kept straight. The head-lead supine balance drill has more explanations about this technique. 2) You don’t keep your body straight but bend at the hips. This is often the case for certain swimmers where their kick is more akin to a bicycle kick rather than a flutter kick. Ideally, your hips and knees should only bend a little while flutter kicking. As explained above, if you don’t keep your body straight, it will be difficult for you to lean back and use the buoyancy of your lungs to raise your hips and legs. While swimming backstroke, your body should roll from side to side, between 30° and 45° from a flat position. Your body rolls toward the side of the recovering arm as it is about to enter the water, while the other arm is about to leave the water at the end of the underwater arm sweep. Rolling from side to side allows you to use your chest and back muscles in addition to your shoulder muscles, hence increasing propulsion. Rolling from side to side also decreases strain on your shoulders, making them less likely to develop the swimmer’s shoulder injury. Please note that backstroke swimmers often roll too little rather than too much. So you can try to roll more to the side than usual to see if this improves the grip of your arms in the water. Whereas your body rolls from side to side during the backstroke swimming cycle, your head stays in a fixed neutral position. It is in line with the trunk and neither tucked in nor rolled forward. Your face is above water, and you look straight up or slightly backward. Some coaches use the following backstroke drill to practice a neutral head position: they have their swimmers swim backstroke with a small bottle of water placed on their forehead. Should I need to go to a doc? Or is it just beginners bad technique blue? This sounds strange, I don’t remember having experienced something like that. So yes it might be a good idea to have a check-up by a doctor, just to be on the safe side. Hi, my name is Joshua. I’m new to swimming so I’m starting to learn back crawl. But whenever I move my arms my face goes under water which makes the water go into my nose. Please have a look at our backstroke swimming drills, which among other things address balance when floating on the back. Today is the second day of learning back stroke… I am either not moving further or moving in a different direction. Please suggest what could be my mistake and how can I correct it? It could be that you have stiff ankles. Can you point your feet? If not, start using short swimming fins to loosen up your ankles. I am a beginner and started doing backstroke 2 days ago. While I try to move my arms, the water goes inside my nose. I know I have to work on my posture while swimming. However, as soon as the water goes inside my nose, I start having a terrible headache. Especially at my sinus areas. The headache goes away the moment I do freestyle swimming with my head pointing downwards. As a beginner you most likely still lack breath control and balance. So you let water run up your nose and maybe your head also goes underwater. Please follow the backstroke drills to correct this. A quick fix might be to use a nose clip until you have the technique down. Hi I’m a beginner swimming and sometimes my legs sink, while doing the frog kick. It happens not so much with the flutter. Is that normal? I am a 62-year-old and in my third month of learning how to swim. I can do backstroke (with both arms) easily and can do 20 lengths (25 M each) in an hour’s time. However, I still find difficult to do freestyle. I seem unable to inhale/exhale properly. Similarly, I’m not comfortable with Butterfly. I find front crawl and butterfly to be the most difficult to learn, so it takes time (weeks / months). 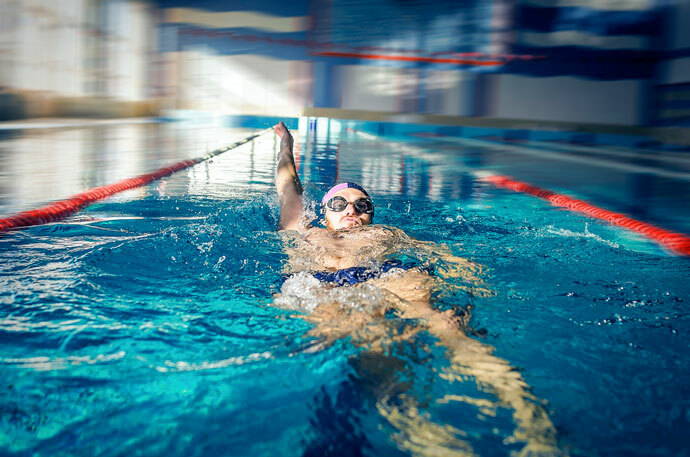 I suggest that you follow the series of exercises as we propose for each swim stroke. Good luck! First 25m I can swim backstroke without my legs sinking but after that I cannot manage to do the same, it starts sinking. Thereby all kicking was below water level. Also, I used to look upward in forward direction, then only can I manage to float my legs. However I was advised to look at my feet to stop sinking legs and swim straight. Is that correct? While swimming backstroke the head should be and stay in a neutral position, in line with the trunk. You should look straight up and not either forward or backward. In that position your body should form a straight line and you should feel balanced. While kicking, the feet can break the water surface a bit. There should be no reason that you can only manage to do 25m, except if you are kicking too hard and get tired, which could indicate a balance problem. As always, follow our (backstroke) drills to get balanced and be able to swim in a relaxed way. When my daughter enters her right hand on backstroke her head tilt to the right. She tried the drill with a bottle on her forehead but it works only at that time. She doesn’t do that to the left side. How would she fix not to tilt on her right side of head besides bottle training? I love swimming and all but whenever I try to float on my back my legs always start to sink. The only time I actually float is when I have flippers on. I have tried everything to keep my legs up but they always just sink. Do you know anything that could keep me afloat? It’s hard to say why your legs are sinking. Your flutter kick may be ineffective. The use of short swim fins and practicing vertical kicking in that case can help. Maybe you don’t keep your body in a straight line, which throws you out of balance? In this case, I recommend you practice our series of drills for the backstroke. If possible, ask a friend, swim buddy, or lifeguard to have a look at your backstroke. They may be able to spot an error in your technique that is causing the problem. I love doing laps at pools but whenever I do a backstroke I always fail and my nose fills up with tons of water. Do you know how to prevent that?